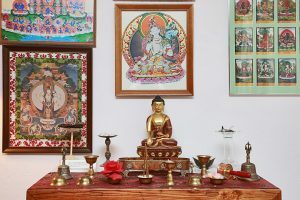 In Tibetan Buddhism, the monastery is the place where we learn the spiritual practices and the retreat center is a focused time for spiritual practice, as supervised by H.E. Dagyum Chenmo Sakya. It is an opportunity to attain a new level of personal renewal and spiritual practice. Near Freeland, Washington, on the south end of Whidbey Island, is a 72-acre wildlife sanctuary with forest wetlands, three ponds, and abundant wildlife: “Earth Sanctuary.” Through the generosity of benefactor, Chuck Pettis, Sakya Monastery Members may use the Tara Meditation Center, Sakya Monastery’s retreat center, located at the southeast corner of the property. Earth Sanctuary, nature reserve and meditation parkland, combines art, spirit and, the latest state-of-the-art in ecology to create a unique place for the application of Tibetan Buddhist teachings, personal renewal and spiritual growth. 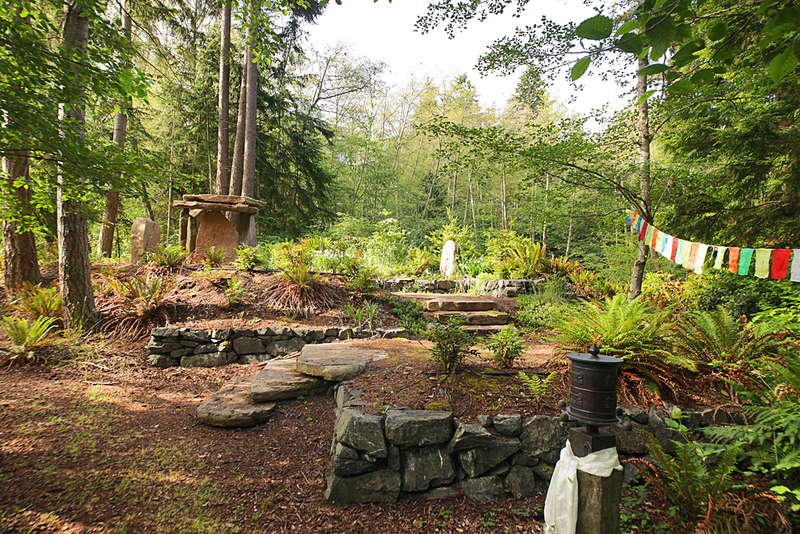 The Tara Meditation Center at Earth Sanctuary is designed to support reflection, meditation, personal renewal, and spiritual growth. The house and the grounds surrounding it have been blessed, consecrated, and energetically optimized according to Feng-Shui principles and practices. The Tara Meditation Center is available to Sakya Monastery Members wishing to make meditation retreats of one day or more. 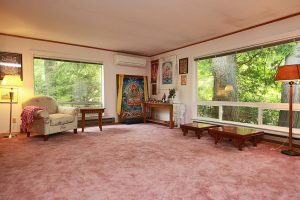 The Tara Meditation Center can also accommodate one-day group mediation retreats or 25 people or less. The Tara Meditation Center is available for use by Tibetan Buddhist meditators from all Buddhist sects, especially students of H.H. Jigdal Dagchen Sakya. All retreats must be approved by H.E. Dagyum Chenmo Sakya. Note that Sakya Monastery Members receive a generous discount from the standard rental rate. 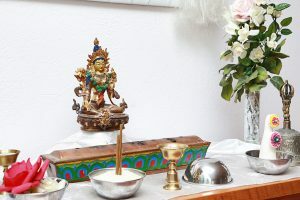 The Tara Meditation Center provides the Tibetan Buddhist spiritual community with a quiet setting that is free of distractions and is conducive and supportive of special Tibetan Buddhist practices. Tibetan Buddhist meditation retreats at the Tara Meditation Center are made under the supervision of H.E. Dagyum Chenmo Sakya, the representative of H.E. Avikrita Vajra Sakya, Head Lama of Sakya Monastery in Seattle. She approves individual retreat plans and can help guide meditators toward an illuminating experience. There are three levels of retreat practice for Tibetan Buddhists: beginning retreats (involving simple mind-training meditations—such as the practice of listening intently to natural sounds), intermediate retreats (concentrating on practices such as repeating the vows of refuge, saying the one-hundred syllable mantra, and making mandala offerings), and advanced retreats (involving meditational practices dedicated to one deity). 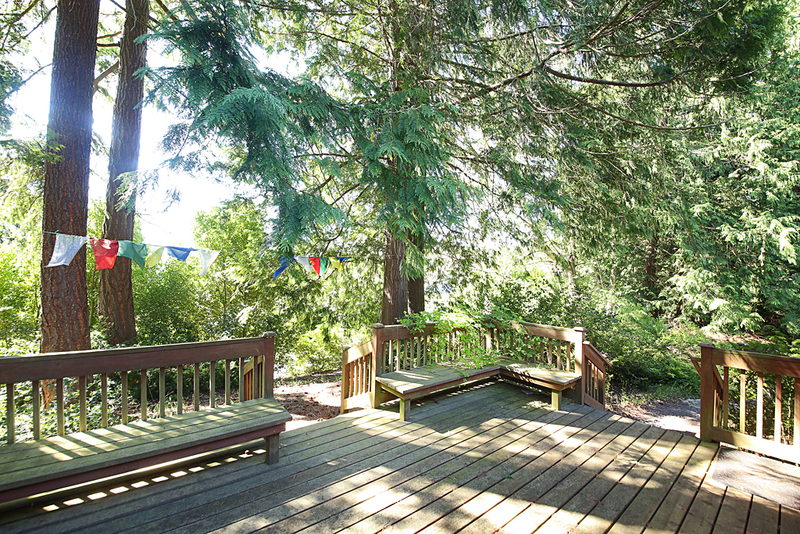 This retreat center is a sanctuary for all people. Come and rest your soul from the pressures of your samsaric existence. In this place of peace and in this moment of repose, let your tired spirit come in contact with the soothing realization of the nature of your own self. In Tibet, hermits spent months and years in solitude high in the mountains. Today, we have this opportunity to go back to nature even in the midst of civilization and yet feel so close to our very basic origins. As sentient beings, we are all interdependent and so to respect the environment in which we live is very essential. 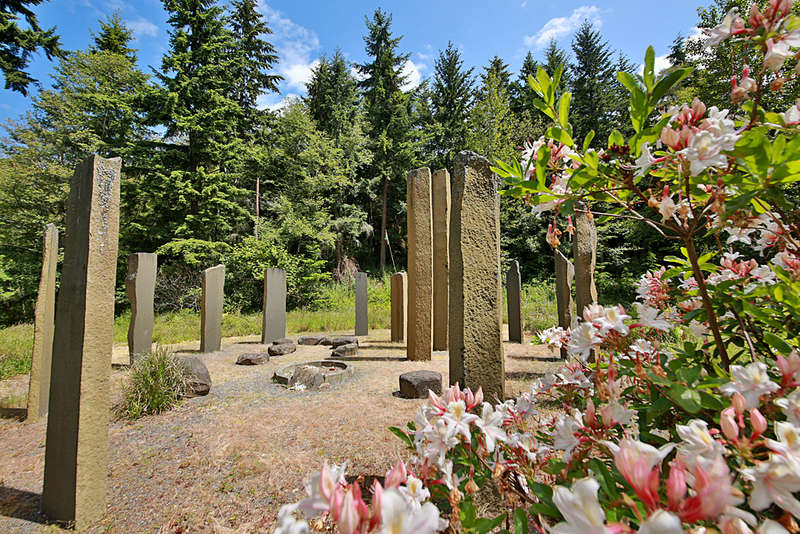 May this retreat center serve as an example for the harmonious co-existence of humankinds and nature. It is my prayer and hope that people may enjoy the pristine beauty of this place and take back with them a higher understanding of their purpose in life. The proximity of the Tara Meditation Center to the woods and ponds of Earth Sanctuary provides meditators with a special opportunity to commune with nature, while focusing on spiritual practice. Retreatants are welcome to walk the peaceful and beautiful trails around Earth Sanctuary’s three ponds and through its forest. Sacred spaces, consecrated by H.H. Jigdal Dagchen Sakya and H.E. Dagmo Kusho Sakya are excellent for meditation. 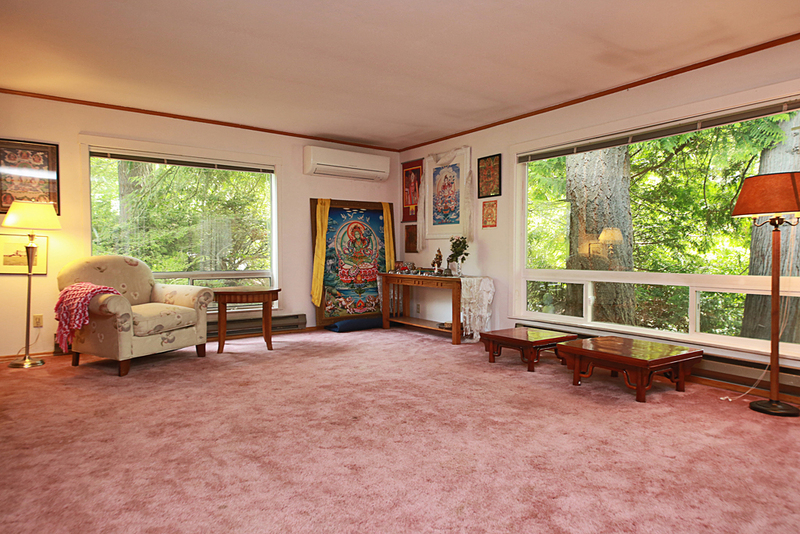 The Tara Meditation Center utilizes an entire single-family dwelling. Those renting it have the use of the entire house, as well as access to the Earth Sanctuary property, which is immediately adjacent. The building has electric heat which can be supplemented by the house’s wood stove. 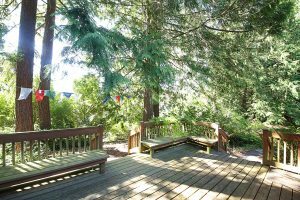 The area outside the house is carefully and elegantly landscaped and features a deck. The Tara Meditation Center house has a combination meditation/living room with two Buddhist shrines, meditation pillows, a sofa, easy chair, a wood burning stove, and a variety of spiritual and meditation books. Ten meditation chairs are also available. 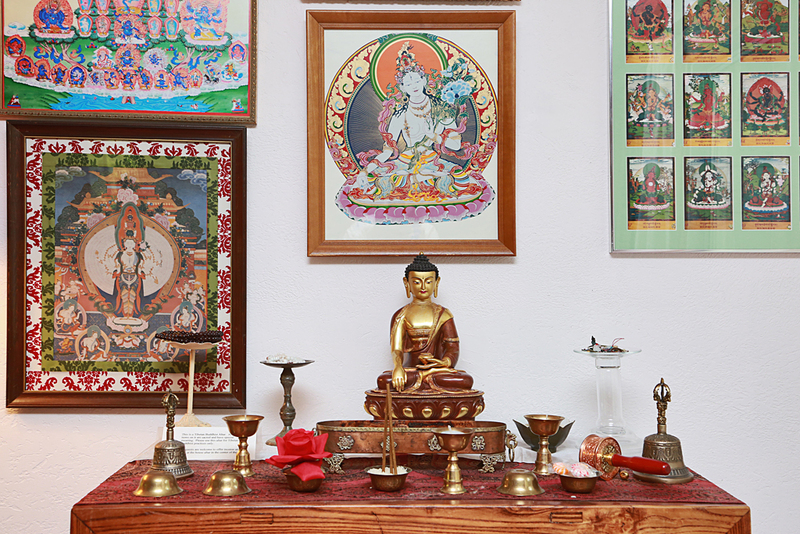 The meditation/living room has a beautiful collection of Tibetan Buddhist art, a Tibetan Buddhist shrine, and Tara Shrine and a non-denominational shrine. A curtain is available for interfaith practices. The house has two bedrooms with single beds for overnight stays, and a bathroom. 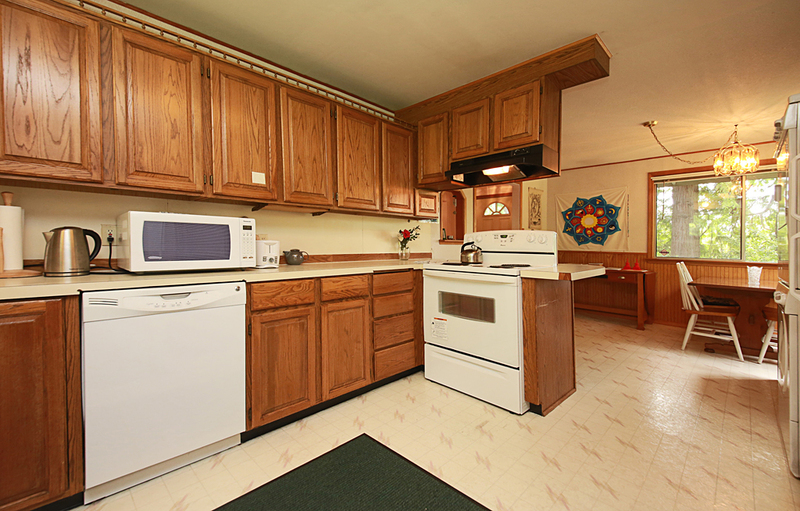 You are responsible for preparing your own meals in the fully equipped kitchen*. The grounds are carefully landscaped. To facilitate your retreat, Earth Sanctuary’s caretaker, Celia Sullivan, will meet you and orient you to the Tara Meditation Center and Earth Sanctuary’s sacred spaces and trails. The house in which the Tara Meditation Center is located and the grounds surrounding it have been blessed and consecrated by H. H. Jigdal Dagchen Sakya and H. E. Dagmo Kusho Sakya. 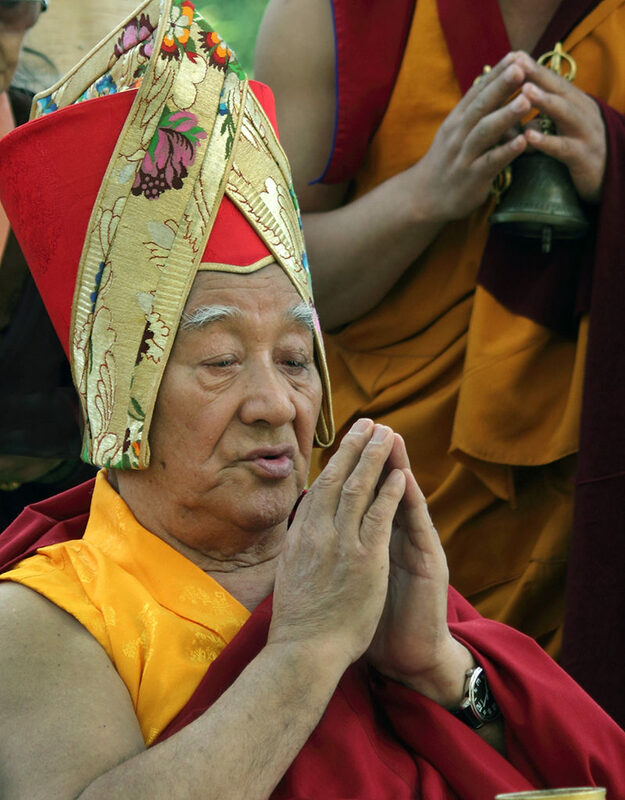 The entire Earth Sanctuary property has been also blessed by Dagchen Rinpoche and Dagmola as well as spiritual leaders of other faiths. In addition, Earth Sanctuary has been energetically optimized according to Feng Shui principles and practices. Both Chinese and Tibetan Feng Shui systems have been used in determining design and placements. Two bedrooms, each with a twin bed for retreatants. The beds come with clean linens, down comforters and pillows. There is also a walk-in closet between the two bedrooms. 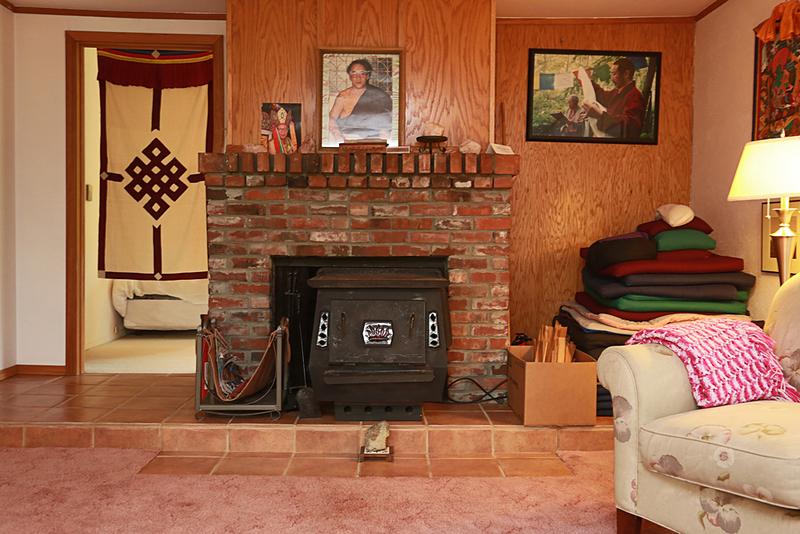 A combination meditation/living room with three shrines, sofa, easy chair, and wood-burning stove. A variety of spiritual and meditation books. Nine zafus with zabutons (Japanese meditation pillows). Prostration Boards (for Ngon-dro practice). Ten chairs suitable for seated meditation. A fully-equipped kitchen and dining area. A bathroom with clean towels and washcloths. A closet and storage area. H.H. J.D. Sakya, H.E. Dagmo Kusho and members of Sakya Monastery thank Chuck Pettis for his continued support of the Tara Meditation Center. Due to his compassionate and meritorious activities, may this peaceful site endure eternally for the benefit of all beings. 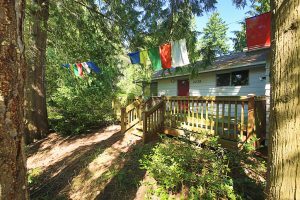 The following rates include the use of the Tara Meditation Center house, as well as access to the Earth Sanctuary property. Very reasonable rates have been established to encourage Sakya Monastery Members to use the Tara Meditation Center. 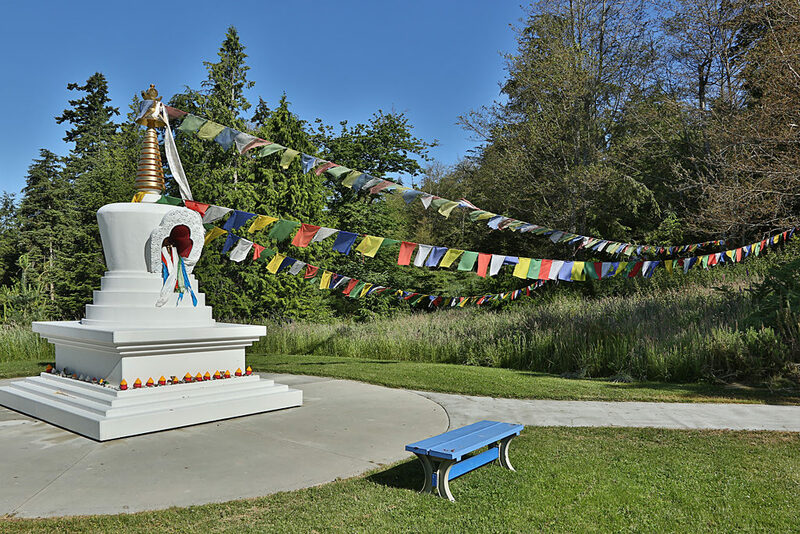 If members feel that more value has been gained from the retreat than the modest fee they paid, they are encouraged to make additional donations to Sakya Monastery or to Earth Sanctuary. 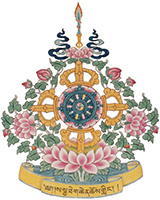 Ngondro retreat: Refuge; Vajrasattva; Mandala Offering; Guru Yoga. Meditational practices dedicated to one deity, e.g., Chenrezi. All retreatants must make reservations for the Tara Meditation Center in advance. Leaders of meditation groups need to set up a reservation for their group. To make a reservation: read the appropriate information on this website, then print, read, and fill out the two-page application form, as well as the release of liability form. 100% of the total amount is due at the time of your reservation in order to confirm and finalize the reservation. Checks (in U.S. Dollars), cash, or credit cards are accepted. If you cancel 30 days or more before your arrival date your deposit (minus a $25 Service Charge) will be returned. If your retreat proposal is not approved, the entire fee will be fully refunded. Applicable taxes will be added to your final bill. No refunds will be made for shortened stays. You are responsible for transportation to and from the Tara Meditation Center. We regret we cannot accommodate any children under 12 years of age. The check-in time is 2:00 p.m. The check-out time is Noon. 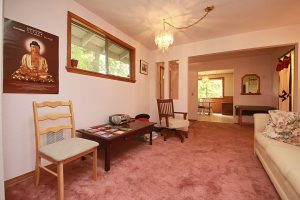 Guests must help pick up and clean the house before leaving. What do you need to bring to the Meditation Center? Materials for your spiritual practice (scriptures, shrine photos, votive candles in containers, incense, bell, journal, etc.). Clothing: For the Meditation Center: modest and comfortable clothing, including bathrobe and slippers. For walking the Earth Sanctuary property: hiking shoes and outdoor clothing appropriate to the season. Food: Bring enough food for your stay. All food and drink must be kept in the kitchen area. You are responsible for preparing your own meals. Two supermarkets are located nearby. Please treat the grounds, building and residents with care and respect. Return the areas which you used to the condition in which you found them or better. Be sensitive to birds and wildlife. Do not disturb or hurt any animals or birds, especially in nesting and breeding season. Hike only on the cleared trails. Remain outside of marked ecologically sensitive areas, including the bog island. Please do not swim or canoe in the ponds. No fires are allowed anywhere on the property. Please dress appropriately for the retreat setting: simple, modest, and comfortable clothes are preferred. Candles (only votives in containers are permitted) and incense are allowed in the main meditation room only. Candles and incense should not be left unattended. Illegal drugs, intoxicants, and firearms are not permitted. Abstain from stealing, sexual activity, and telling lies. Alcohol is permitted only in the context of certain ceremonies. Please do not smoke or chew tobacco anywhere on the property. Park in designated areas only. You may be asked to park your car on an adjacent property (gated) away from the house. 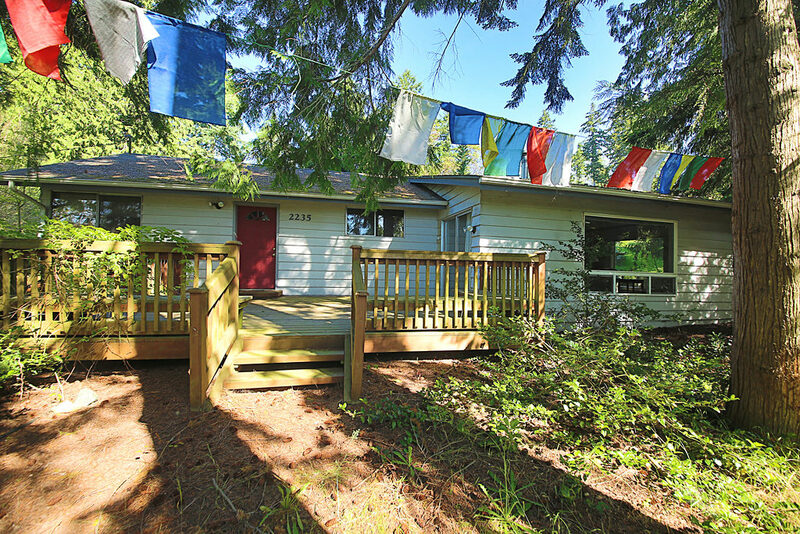 Tara Meditation Center at Earth Sanctuary (The Earth Sanctuary House), 2235 Newman Road, Langley, WA 98260. Note: do not send mail to this address – no mail is received here. Direct all correspondence to Sakya Monastery. From Seattle, take I-5 north. From the Eastside, take I-405 north to I-5 north. After passing the Everett city limit sign on I-5, take Exit #189, the “Whidbey Island/Mukilteo Ferry” exit, and head west on Route 526 West. After a few minutes, you will pass by the huge Boeing buildings. Shortly after that you will come to an intersection with a signal, where 526 West becomes 84th Street SW/WA-526. Turn right here and go down the hill to a stoplight and major intersection. Turn right here onto the Mukilteo Speedway, which leads to the small town of Mukilteo where you get the ferry to the town of Clinton on Whidbey Island. As you come down the hill get into the ferry line where the signs tell you to do so or whenever you see the “end of the line” of cars. Do not “cut” into the ferry line, or you may be sent to the back of the line. Ferries leave every half hour on the hour and half-hour. The ferry ride from Mukilteo to Whidbey Island lasts about 20 minutes. Please note that sometimes there are lines to get on the ferry – especially on weekend evenings in summer. 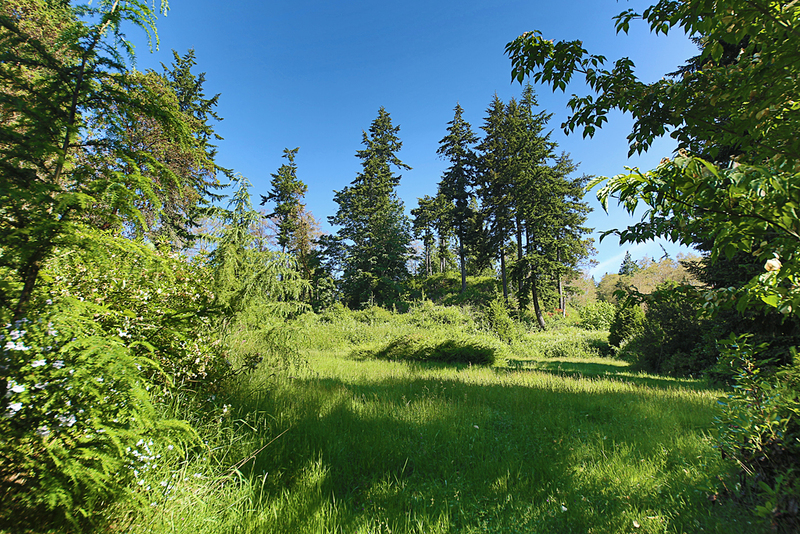 Once on Whidbey Island, drive north on the main highway, Route 525, for approximately 7 miles. Approximately 100 yards past Useless Bay Road on your left make a right hand turn onto Newman Road. Drive about 1/4 mile to Emil Road, which will be on the right. Earth Sanctuary House is located at the Northwest corner of the intersection of Emil Road and Newman Road, at 2235 Newman Road. There are many newly planted trees and shrubs in front of and around the house. Pull into the driveway and park. If you continuing driving and see ponds on the right, you have gone too far! If you are a day visitor, do not park at the house – please continue driving on Newman Road and park at the West parking lot (see below). Follow the direction above for reaching the Earth Sanctuary House, but continue driving .6 miles past the Earth Sanctuary house. 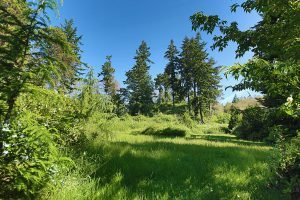 You will see Earth Sanctuary’s ponds on the right. As the road begins to go down a slight hill, watch for a driveway on the right (the first driveway on the right once you pass the Earth Sanctuary House). The mailbox at this driveway says “2059.” Turn right into this driveway. Go up the gravel-covered road for about 50 feet and go to the right when you reach the Y in the road. The West parking lot is about 100 feel from the Y. Park here. For a map of Earth Sanctuary, click here. Take 524 South. Just after Freeland, watch for Double Bluff Road. Make a left on Double Bluff Road. Go a short way to a “T” with Newman Road. Make a right turn, shortly pass Maple Glen access road on the left, and then in about 100 yards there will be a driveway on the left. There is a mailbox (2059) by this driveway. Day visitors should turn left into the driveway, go about 50 feet and take the gravel road off to the right until you get to the parking area. People who have rented the Earth Sanctuary house should continue on Newman road east 0.6 miles to the Earth Sanctuary house at the Northwest corner of Newman Road and Emil Road: 2235 Newman Road. People with serious mental disorders should not come with the expectation that retreat will cure or alleviate their metal problems. Retreat is not a substitute for medical or psychiatric treatment and is not recommended for people with serious psychiatric disorders. The Earth Sanctuary I LLC and Sakya Monastery of Tibetan Buddhism are not liable for any personal injuries, for any reason, that may be sustained during stay at Earth Sanctuary.